King Manuel  has learned that $750,000 worth of the crown jewels , which are the property of the state, were sold by his father, King Carlos , in order to defray his expenses. The administrator of the royal house declared that the government had consented to the sale, and the governor of the Bank of Portugal declared it had been made in order to avoid a scandal. King Manuel then announced his intention of refunding the value of the missing jewels. 1. Cropped version of a photograph available via Wikimedia Commons; source here. 2. King Manuel II of Portugal (1889-1932) was the last king of Portugal, reigning for only two years (1908-1910) between the assassination of his father and older brother (during which he was also injured) and the October 1910 revolution. 3. The Portuguese government still has a collection of crown jewels, although a theft in 2002 depleted the collection and led to a much stricter display policy. You can read more about the items in the collection here at Wikipedia. 4. 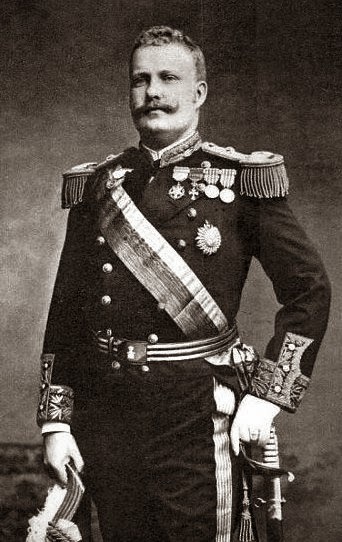 King Carlos I of Portugal (1863-1908) reigned in Portugal from 1889 until his assassination in Lisbon in 1908. He was the son of Luis I of Portugal and Maria Pia of Savoy; he married a French princess, Amelie of Orleans, in 1886.